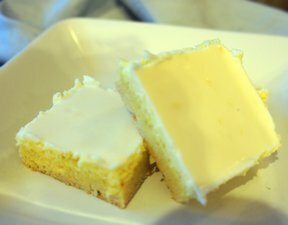 The refreshing and rich citrus taste of lemon is tempered by the subtle crumb crust and topping, making this bar an enjoyable mix of flavors and textures. Using cooking oil or a baking spray, grease the bottom and lower sides of 9 x 13 baking dish. Using a large bowl, begin making crumb crust and topping by combining the cake mix, butter, and egg. Mix all of the ingredients thoroughly until the crumb mixture becomes granular in texture. Crush the crackers finely with a food processor or place the crackers in a plastic bag and crush with a rolling pin. Add the cracker crumbs into the crumb mixture. Remove 2 cups of the crumb mixture and reserve for the crumb topping; use the remainder for the crust, which is spread over the bottom of the baking dish. Place the baking dish containing the crumb crust in the oven and bake for 15 to 20 minutes, or until the crust is golden brown. Using a small mixing bowl, combine the egg yolks, milk, fresh lemon juice, and the lemon zest. Mix the ingredients well using a whisk or an electric beater. 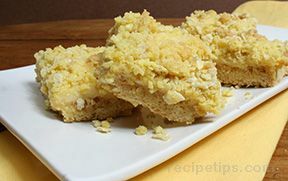 Pour the lemon mixture over the baked crust and sprinkle the reserved 2 cups of crumb topping over the lemon mixture. Place the baking dish in the oven and bake for an additional 20 to 25 minutes until the crumb topping is golden brown. 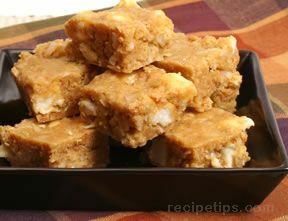 Remove from the oven and allow the bars to cool for 1 to 2 hours; then slice into squares, cover the bars with foil or plastic wrap, and refrigerate prior to serving.